In mid-2008, indie duo, Hungry Lucy were recording weekly podcasts and had finished writing songs for their 4th full-length release. By all accounts, things were going well for the band. Popularity was at an all-time high, and their music was selling nicely across the globe. From the inside though, Hungry Lucy had become more about social media, and less about the kind of great songs the pair loved to write. Gone was the mystery, spark and creativity that once burned bright for Christa Belle and Warren Harrison. With that, the couple ceased podcasting, scrapped most of of the nearly-complete album and immersed themselves in making something truly magical. And so they did. At long last their fourth album has been midwifed into existence and it’s an interesting and refreshing addition to the Hungry Lucy canon. Known for their languid, balladesque songs, the band mix things up some. Not a lot – they haven’t reinvented the earthy goddess wheel here – but just enough to make you raise your eyebrows as you take in the new material. The trip back to the well for more inspiration paid off. Now, Softsynth was actually quite a fan of their famous podcasts but it’s true – it did start to feel like that was all they were doing. And it’s nice to see them thinking purely in terms of creating new musical content again. From the straight-forward pop of “Wandering” to the swirling chamber pop of “Balloon Girl” to the awesome sparse electronics of the title track, they have created a clean, gorgeously produced collection of electronic goodies that stand as some of their best work to date. There’s some songs that feel warm and familiar in their pokey, meandering, sweet way too, only now they seem more perfectly balanced than in the past. On songs like “The Standing Ones” we hear a newfound energy that one does not necessarily associate with this band and it becomes clear just how lovely Belle’s voice sounds at any tempo (and her voice, always an incredible instrument, is powerful and commanding while still betraying the vulnerability that has laced through their songs going all the way back to their earliest work in 2000). The wait was well worth it. Nice to have them back sounding as strong and present as ever. This is a most welcome addition to the electronic music world and hopefully will see them garner a wider audience, long overdue and much deserved. 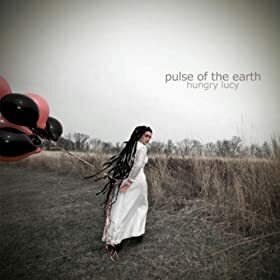 This entry was posted on February 11, 2010 at 11:19 pm and is filed under Review with tags Hungry Lucy, Pulse of the Earth. You can follow any responses to this entry through the RSS 2.0 feed. You can leave a response, or trackback from your own site.